I lived 35 years without thinking about horses. The closest I came to a horse was seeing one on TV. From that video I learned the word 'fetlocks'. And that was the extent of my information. Then a few years ago I met my girlfriend. She teaches horse riding and she has two horses and a pony. She talks about horses. ALL THE TIME. In the last 3-5 years (not sure how long we've been together) I've learned a lot about horses. I learned that horses DO have dentists. I learned that 40% of horses are scared of donkeys. And I learned that if you let a Shetland pony eat as much as it wants it gets REALLY fat and has to be sent to fat camp. The strange thing is I talk about horses all the time without realising it. So do all native speakers. 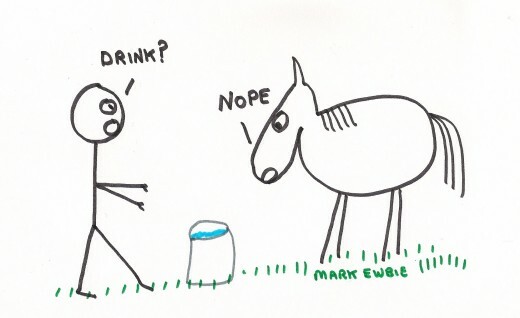 In this article I'm going to explain some horse idioms and phrases and suggest ways you could use them to make your English sound more advanced. This phrase is used when you want to leave a conversation/meeting/party without saying where you are really going. Maybe you want to go to the toilet but don't want to say that. Maybe you've got a date with your best friend's sister. Can you use this in your English exam? Might be hard. You shouldn't say it in part 1 of the Speaking test and then leave the room. If you get an informal letter in the Writing test then you could use this phrase to end the letter. If you are a professional horse dentist - and my girlfriend tells me that's a real job - then you can tell a lot about the health of a horse from looking at its teeth. That's something you should do if you want to BUY a horse. It's like checking a car's engine before you hand over the money. But if someone gives you a car for your birthday you shouldn't go checking in the engine saying things like 'Ugh it's a bit low on oil' or 'this fan belt has seen better days'. Just say 'thank you for the free car that's very kind of you'. So 'looking a gift horse in the mouth' means 'being ungrateful'. Yes, probably. I can imagine a task where the local government wants to redevelop the library. Your job is to decide what to spend the money on. If your partner proposes an option that isn't your first choice you could use this phrase because getting something is better than nothing. - "I think we should use the money to buy new computer equipment for the library." - "Well, most people have computers at home these days so I don't think that's the best use of the cash. But I wouldn't look a gift horse in the mouth - the library is near my house so those computers would be handy if my laptop ever broke." Possibly. If you're in the Speaking test and your partner doesn't agree with you, this phrase is one way to say the topic is over. - "But I really think we should buy computers for the library." - "I don't really agree but we're beating a dead horse here. Let's move on to the next part." Or if YOU want to keep talking about something your partner doesn't agree on. - "So that's decided. Let's move on to the next topic." - "Wait a second, and I'm sorry to keep flogging a dead horse, but there's another reason we shouldn't buy computers for the library." This phrase is about helping people. Imagine you want your fat English teacher boyfriend to lose some weight. You buy him a tennis racquet and arrange lessons with the local tennis pro. But he doesn't want to leave the apartment so the racquet stays in its plastic wrapping. Point is, you can help people, but they have to take the final steps themselves. - "I think we should buy computers for the local library." - "It's a good idea in theory but the main problem is, well, you can lead a horse to water..."
- "I mean, you can buy the computers but you'd also need to provide training for all the people who don't know how to use them. So it could get expensive." It means getting information from the source, for example, hearing someone say something (instead of just reading about it). - "We should buy computers for the library because old people would use them." - "I'd want to hear that from the horse's mouth first." - "You mean do some research?" It means: "Slow down! Stop! Not so fast!" The following image doesn't help you understand the idiom, but I think the wagging tail is cute. 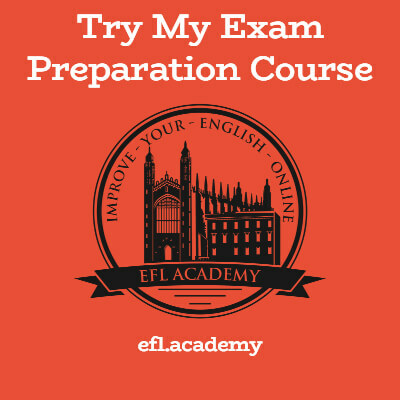 If your Speaking test partner is going too fast, you could use this phrase. - "I think the library should get new computers and the tourist office should get more staff." - "Whoa there, hold your horses! Let's talk about the library first. Why would anyone go there to use a computer?" It means to eat a lot. It's not the same as 'eat like a pig' which means eating noisily and messily. Interestingly, my girlfriend eats like a horse AND like a pig. Yep! If they ask you any food related questions in part 1 of the Speaking test. Tell them you eat like a horse but you aren't very fussy. Or tell them you eat like a horse but you detest apricots and pineapple, both of which are super gross. A dark horse is a horse that wins a race but nobody expected it. It's used a lot in sports - maybe your country is a dark horse when it comes to the next World Cup. Someone like Belgium - not a team that everyone talks about, but one with great players. You can also use it about someone with an unexpected skill. It can be used in any context where there's a competition, but the 'unexpected skill' thing is probably your best bet. - "What do you enjoy doing in your free time?" - "Well I might not look like it, but actually I'm a bit of a dark horse when it comes to cooking. In my leisure time you might find me in the local farmer's market or chopping up some vegetables." The thing at the front is called a 'horse' and the purple vehicle behind it is the 'cart'. This is a very sensible arrangement. It's even called a horse and cart ride so you know which goes at the front. Putting the CART in front of the HORSE would be the WRONG WAY ROUND and would be DEEPLY STUPID. I hear Donald Trump had a business that offered Cart and Horse rides, but he lost money from it. Sure. You could use this in the Writing test to describe doing things in the right order. Or more precisely, NOT doing things in the WRONG order. Or in the Speaking test. - "Would you ever consider living abroad?" - "I don't think about the future too much - I'm not the type of person who puts the cart before the horse. First I have to graduate from university. But I do sometimes daydream about living in Manchester. My dream man is from there." Interested in more horsey language? One of my students made a page with German-English translations of all the horse vocabulary you could ever want!